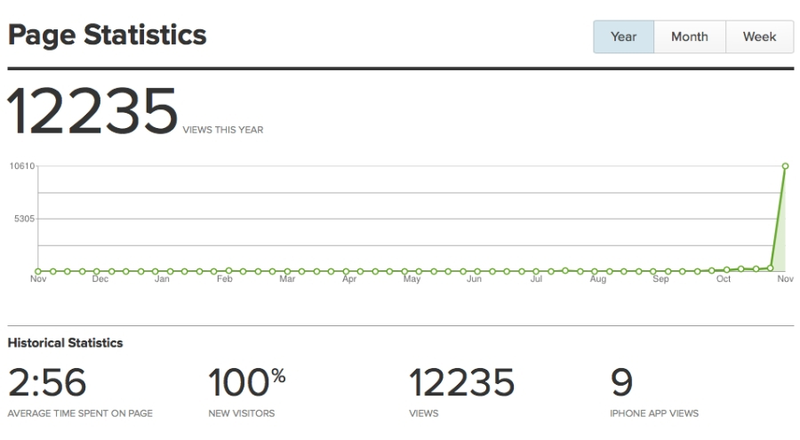 12,235 page views! You can realize an insanely sharp increase in nameplate page views doing a few simple things every couple days! I recently began paying a bit more attention to the care and feeding of my freshly revamped nameplate page on about.me (about.me/johnsonjason) and I've seen a huge uptake in the amount of exposure my nameplate page receives. Today, the day after Thanksgiving, I logged in to find a dramatic increase in page views. As in prior, I was hovering around the 2,000 page views and averaging a couple of hundred views/week but I saw a Gamera sized jump to 12,000+ views over the last week. A relatively short period of time to see my views climb so steeply; 10652 views this week to be exact. drumming up more business and.. The next handful of posts I write here on the blog will be a multipart series in which I'll share some simple, straightforward ways that you can make the most of your nameplate and boost your exposure too. Spend a few minutes here with me and then just a few minutes, here-and-there, every-other day on your nameplate to boost your exposure to help achieve your goals online, be it more connections, more newsletter or podcast subscriptions, more business opportunities, getting hired, you name it. Stay tuned and I'll share if I'm able to achieve my two main goals of finding clients to get more business lined up in my project pipeline and of connecting with new interesting people online and around town. Newer PostHey. Get to Work.